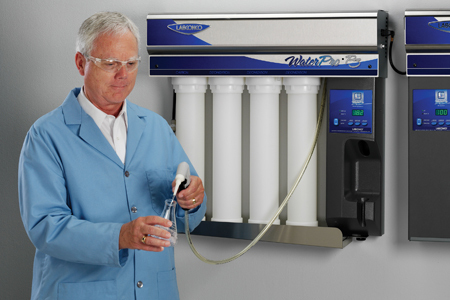 Water Purity And Lab Glassware Washers: Just How "Pure" Does It Have To Be? Water purity supplied to a laboratory glassware washer for rinsing has been the subject of debate in regards to the end result of producing clean glassware. It should be noted that the term ‘deionized water’ does not reference any specific water purity level. The deionization of water produces water within a wide range of purity levels. The deionization process can be used to make medium grade water at 10-20 microsiemens of conductivity, or, it can be used in polishing systems to produce water with a 16-18 megohm resistivity level. There are four points to consider when selecting the purity level of the water used for rinsing in a stainless steel laboratory glassware washer.